The Louisiana eviction notices to quit are used as the first step in the process of notifying a tenant that they are in violation of their lease (or if the landlord simply wants to terminate a tenancy-at-will). Before a landlord can ask the courts to take action to remove a tenant, the tenant must have written notice from the landlord that there is an issue and must have a chance to rectify the problem, whether it be for non-payment of rent or some other breach of the lease. If the tenant still fails to respond after notice and continues living at the property, the landlord may then file the Petition for Eviction, Soldier’s/Sailor’s Affidavit, and the Court Information Sheet with the Local Court. The court will issue an Order to Show Cause and set a hearing date so that landlord and tenant can present their cases. If the landlord prevails, the court will issue a Judgment of Eviction and tenant will have 24 hours to vacate the premises. 5-Day Notice to Quit (Non-Payment) – This notice is used when the tenant has failed to pay rent when it is due under the terms of the lease. Landlord must give the tenant written notice and five days to pay what is due or move out. 5-Day Notice to Quit (Non-Compliance) – This notice is used when the tenant is breaching a provision in the lease, other than non-payment of rent. For example, the tenant may be keeping a pet when the lease states that pets are not allowed. The tenant will have 5 days to cure the default or move out. 10-Day Notice to Quit (Month to Month) – This form of notice is used when the landlord seeks to end a month-to-month tenancy. In this case, tenant has ten days to vacate the property. In Louisiana, rent is due on the day specified in the lease. If rent isn’t paid, the landlord must provide 5-Day Notice to Quit (Non-Payment) to the tenant and allows him or her five days to pay. You will need to make a copy of the notice to file with the court in the event you need to proceed. Step 3 – The court will then issue an Order to Show Cause (Adobe PDF – MS Word) which must be served by a constable. The Order to Show Cause sets forth a hearing date. Step 4 – If tenant fails to show up for the hearing or the judge rules in favor of the landlord, the court will issue a Judgment for Eviction. The landlord may then obtain a Warrant for Possession if the tenant still fails to vacate and obtain the assistance of a constable. Two basic documents will be necessary at the time of providing a Tenant or Month to Month Landlord a legal and appropriate notice. The first document is the Lease as this will contain information that must be reported in an accurate manner. The second document is the Louisiana Notice To Quit which may be downloaded here by clicking the “PDF,” “ODT,” and “Word” then, saving the preferred file type to your computer. The Exact Location of the Rental Property defined in the Lease must be defined in the first statement with blank spaces. First, report the “City of” the Rental Property on the first blank space. Second, report the “City of” the rental property on the next blank space. Then, enter the “Zip Code” on the third blank space. Finally, you will be given two blank spaces to report the Building Number/Street of the Rental Property and the Apartment Number. If the Rental Property does not have a Unit Number, you may leave this blank. The Date the Lease was Signed must be reported in the next statement. This Signature Date must be reported by entering the Calendar Date, Month, and Year on the first, second, and third blank spaces. The purpose of any Notice must be defined within it by the time it reaches the Recipient. There should be a clear message as to what is expected to occur within the time frame it refers to. There will be four checkbox statements available to document the subject and time frame of this Notice. Choose one. If the Landlord must issue this document to a Tenant who has not been compliant with the Terms of the Lease he or she Signed, then choose the “Noncompliance” checkbox. This will inform the Tenant that he or she has five days to cease and correct the Lease Violations that you list on the blank line in this statement or release the Rental Property to the Landlord. 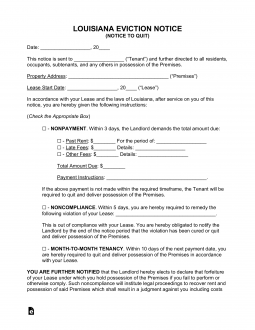 If the Landlord must issue this document to a Tenant to inform him or her of the intent to terminate a Month to Month Tenancy, then choose the “Month to Month Tenancy” checkbox followed by the term “I am your Landlord.” Month to Month Lease Agreements will require thirty days’ notice before their termination thus, designate and enter the Termination Date to be at least thirty days from the Tenant’s receipt of this Notice. If the Tenant must issue this document to a Landlord to inform him or her of the intent to terminate e a Month to Month Tenancy, then select the checkbox labeled “Month to Month Tenancy” followed by the words “I am your Tenant.” You will need to designate and report an exact Date of Termination that is no earlier than thirty days from the Landlord’s receipt of this Notice. Landlords who are issuing this document to a Tenant will need to sign their Names on the blank line following the “You are further notified” paragraph. The “Certificate of Service” section may only be filled out by the individual who will deliver this to the intended recipient. First, the Agent must fill in the Delivery Date and Recipient Name in the appropriate areas of the statement below the section title. Additionally, the Agent will need to indicate precisely how this document was delivered by checking the appropriate checkbox from the choices provided. The first checkbox verifies the document was delivered personally to the Intended Recipient. The second check box will state the document was delivered to a reliable and of age second party either in the intended recipient’s household or place of employment. The last checkbox will declare that personal delivery was not possible and the Notice was to the recipient using First Class Mail.